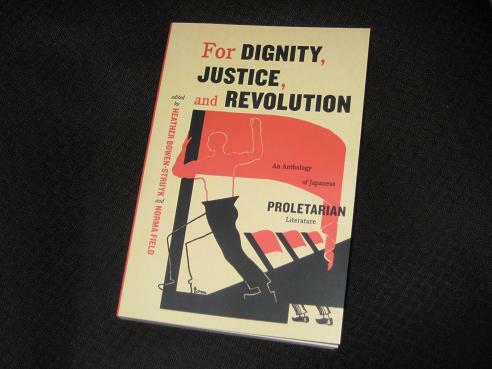 For Dignity, Justice, and Revolution: An Anthology of Japanese Proletarian Literature (edited by Heather Bowen-Struyk and Norma Field, review copy courtesy of University of Chicago Press) looks at an area of J-Lit often ignored by other anthologies, the proletarian literature movement of the late 1920s and early 1930s. Flicking through other collections I own, I noticed very few stories from this movement, and in the introductions it’s usually casually glossed over, if mentioned at all (Donald Keene, for example, is rather dismissive of the genre in the introduction to his Modern Japanese Literature Anthology). This collection, then, attempts to redress that balance, introducing a bumper collection of stories and criticism from many of the movement’s leading lights. The introduction explains the origins of the movement and its complexities. Taking its cue from the Russian formalist movement, the Japanese writers attempted to stay true to these socialist ideals while highlighting the particular issues faced in Japan (a ‘pre-revolutionary society’). The stories here are written about, and for, the poor of the country, shining a light on poverty, industrial relations and police brutality. Many are taken from literary journals, written in the face of constant censorship and fear of arrest, and one interesting touch is how the affected sections here are shown by being crossed out. Oyoshi knew that these incidents could happen hundreds of times and even that wouldn’t be enough to create a society of their own. In order to bring about that society, they’d have to become the stepping-stones for those who would come after, they’d have to put their necks in the noose. She’d heard that when armies of ants moved, if they came to a river they had to cross, the ants in front would pour into the river, pile on top of one another and drown, offering their own bodies as a bridge for the ones who came after them. The young people in the union often talked about having to be just like ants at the front. And they were right. Kobayashi shows the brutal methods the police used to break the activists (something he had personal experience of) and explores the different ways the men cope (in particular, the contrast between the resistance of the intellectuals and the blue-collar workers). Kobayashi’s work also appears among the examples of ‘wall stories’, short stories designed (possibly) to be pinned up in work places and read by workers (a constant dilemma for the proletarian writers was how to get their message across to people who might be unaccustomed to reading). His piece ‘Letter’ is interesting both for Samuel Perry’s translation – an attempt to reflect the original register with American slang – and for the story of a man injured at work, whose slow demise drags the whole family down into poverty. Yi Tong-gyu’s ‘The Bulletin Board and the Wall Story’ (tr. Samuel Perry), a story focusing on the workers’ response to an experiment by bosses in a factory, gives one possible origin for the ‘wall story’, but it also highlights the role Korean writers and workers played in the proletarian movement. As patient and persevering as oxen, as tolerant of pain as a rock, the farmers cast their own bodies beneath the whip for a wage no larger than a cat’s teardrop. From when the stars began fading in the eastern sky until the owls hooted in the forests at night, they worked like wooden puppets, forcing frozen joints to bend against their will. Much of what I’ve described so far suggests that the movement, and the wider society, was very much a man’s world, but women played a major role both in proletarian literature and in the societal struggle. There are several mentions of a 1930 factory strike led by women, and this conflict is fictionalised in Sata Ineko’s ‘Prayer’ (tr. Mamiko Suzuki), showing the energy and violence of this struggle (and the difference in the way the ordinary workers and the Christian minority handled themselves at the time). Another big name in the movement was Miyamoto Yuriko, and her story ‘The Breast’ (tr. Heather Bowen-Struyk) is one of the better contributions here, giving a woman’s view of strikes and hardship and showing the important role women played in supporting activists who found themselves in prison or locked up in police stations. Miyamoto’s (and Kobayashi’s) work drew praise from mainstream writers, but this was not always the case for proletarian literature, with frequent criticism of dull, turgid prose and predictable stories (one example of that here is Hayama Yoshiki’s ‘The Prostitute’ (tr. Lawrence Rogers), a kitsch, clichéd tale of an upright young man angered by the treatment of a poor woman). However, the leaders of the movement were well aware of this, and there are several theoretical pieces in the anthology addressing what it means to write proletarian literature. In fact, proletarian writers, even those whose work tends to be autobiographically inspired, manifest more rich and varied ups and downs in their lives than most Japanese writers to date. We write about subject matter that differs from mainstream literary writers, so people take notice of the commonalities. From a distance, our works may thus appear to be all about the same thing. In fact, there is nothing narrow about the range of topics we write about. I wasn’t always convinced that this is the case; having said that, there is a wide range of texts here, ranging from children’s stories (complete with class-conscious insects! ), flash fiction and stories set across a number of different environments. I have to say this sounds fascinating. Of all the Japanese lit I’ve read, I don’t think any of it could be described as working class and it’s not a movement I would ever really connect with the country. But as you say, with the right-wing tendencies on the increase this is the kind of thing we need to reconnect with. You mentioned that these stories are rarely told in Japanese Literature, and I was wondering why you think that is. Is it difficult to get the stories out of the country or to the people of Japan? Does the Japanese government still control writers through fear? I didn’t think so, so I am curious! Also, coincidentally, there is a guest review on my blog today about a book called Kabuki Boy. It’s not written by a Japanese author, but I know years of research went into it. I say coincidentally because none of my reading encompasses Japanese culture, which is a shame.